Sound Forge Pro 12 with a stereo audio file loaded. The phase meter in the top right corner is in the novel and useful circular mode. With 64‑bit compatibility and VST3 support, Magix’s Sound Forge 12 is ready to face the future. Originally developed by Sonic Foundry in the early ’90s, Sound Forge is one of the longest‑standing audio mastering and editing platforms, alongside the likes of SADiE, Adobe Audition (which started out as Syntrillium’s Cool Edit) and Steinberg’s Wavelab, to name just three of the industry’s veterans. This latest update is claimed to be the largest ever, refreshing and extending Sound Forge’s mastering and audio restoration capabilities to bring it more into line with its competitors, without throwing away its familiar user interface and workflow. Naturally, upgrades are available from previous versions of the software, while there’s also a new monthly subscription option with perpetual updates for anyone who prefers this payment model. The most junior member of the Sound Forge 12 family is the introductory Sound Forge Audio Studio 12. Restricted to mono or stereo editing with 32‑bit floating‑point number‑crunching, this lacks the more sophisticated multi‑channel editing capability and extensive file‑format handling found in the more expensive Pro versions, as well as many of their processing and effects tools and plug‑ins. However, it does support third‑party plug‑ins in VST2 and VST3 formats, and includes Zplane’s Élastique Pro time‑stretch algorithm along with a selection of core restoration tools. It also comes with iZotope’s Ozone 8 Elements mastering suite, and appears to be a popular solution for people wanting to digitise a vinyl record collection. In common with the Pro versions, pretty much everything about Sound Forge Audio Studio 12’s user interface is customisable, so it’s very easy to position the displays and toolbars exactly where you want them, and populate them with the specific tools you use regularly. Moving up to the first Pro version, Sound Forge Pro 12 supports up to 32 audio channels and sample rates up to 384kHz, with 64‑bit‑float number‑crunching as well as DSD file import/export (the base Studio version of Sound Forge can import DSD but not export it). Naturally, Sound Forge Pro 12 includes all the capabilities of the Studio 12 software and supplements them with four high‑quality mastering and audio‑restoration tools ported across from Magix’s Sequoia — a very popular mastering and recording platform in its own right. These comprise Wave Hammer 2.0 (a multiband dynamics processor and volume maximiser), DeHisser, DeClicker/DeCrackler and DeClipper, plus iZotope’s RX Elements audio restoration package, forming a useful range of core audio‑restoration and mastering tools. 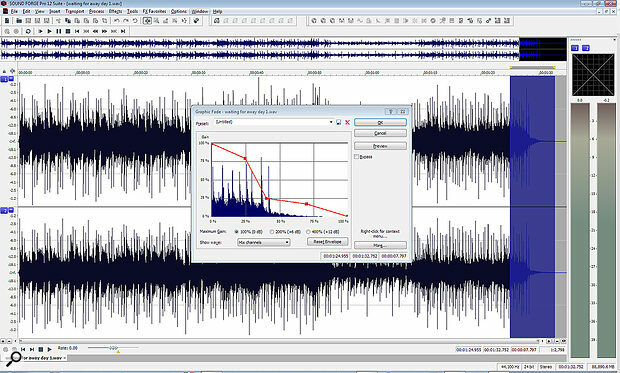 Sound Forge Pro 12 also has the ability to record disc‑at‑once CD‑Rs as well as to author proper Red Book audio CDs, includes the POW‑r dithering algorithm for converting 24‑bit source files to 16‑bit word‑lengths, and offers configurable BS.1770 Loudness metering, the ability to export files in Dolby’s AC3 multi‑channel format, and a facility to create loops in Magix’s Acid format. Pro 12 also includes a range of versatile scripting and batch‑processing capabilities. The flagship version is the Sound Forge Pro 12 Suite, and this expands on the Pro 12 variant by incorporating quite a lot of additional effects plug‑ins as well as another program inherited from Sony, the SpectraLayers Pro 5 spectral analysis/editing package. The additional plug‑in list includes 11 standard effects plug‑ins in the Essential FX Suite, four more in the Analogue Modelling Suite, and three in the Vintage Effects Suite (see box for more details of all the included plug‑ins). Also included is a sophisticated modelling reverb called VariVerb II (which supplements the Acoustic Mirror convolution reverb plug‑in which is standard in all the Pro variants) and Vandal, which is a virtual guitar/bass amp simulator package. All of these plug‑ins have been part of Magix’s range for some years now, and will be familiar to users of their Samplitude packages. Given the extensive list of plug‑ins included with the Sound Forge Pro 12 Suite, it’s easy to assume that this is a conventional multitrack DAW, much like Apple’s Logic Pro or Steinberg’s Cubase. However, that’s really not the case, as Sound Forge works in a very different way. Files can be imported for editing and post‑production, and new recordings can be made directly into Sound Forge — but only with predefined numbers of channels (up to 32), and you can’t subsequently add additional tracks into a project in the way you can with a more conventional DAW. What Sound Forge Pro does really well is make audio editing and mastering rewardingly fast and easy. 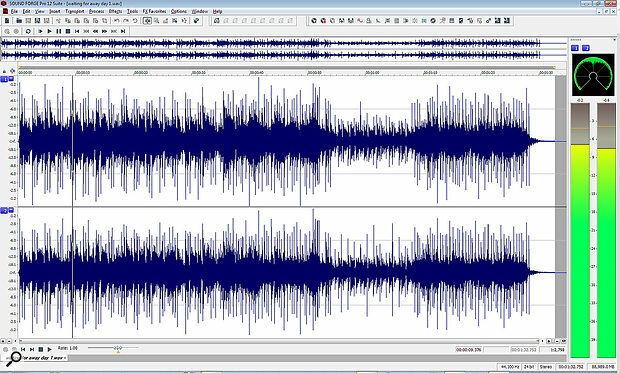 The program starts and loads the previous audio session quite quickly (in around 10 seconds on my elderly Windows 7 PC), and it is pleasingly fast to zoom in/out and navigate around a file (thanks, in part, to the useful waveform overview display always shown above the main workspace). This screen shows two 11.025kHz sine waves, one offset by 45 degrees relative to the sample rate, at the maximum horizontal zoom level. Each wave has four samples per cycle: the top one has them at the positive and negative peaks and zero crossings, while the bottom one has them 3dB down either side of the top and bottom peaks. 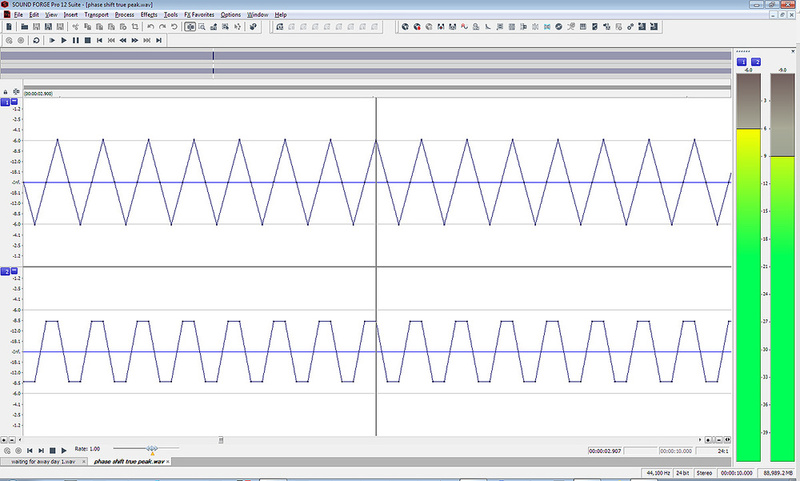 The actual reconstructed waveform is identical (apart from the phase shift) and should be a sine wave. Not only is the displayed image nothing like it should be, but the sample‑peak meter also under‑reads by 3dB... This is very common, but highlights the potential dangers of using the pencil tool to redraw waveforms that don’t look right! The user interface itself is very clean and simple, and can be easily customised if you prefer a specific layout of toolbars (and specific tools), transport controls, meters, and audio file/data information window around the main editing workspace. I particularly like the ability to include traditional goniometers (phase scopes) in the metering window, and the new (to me at least) circular display mode was particularly intriguing. One disappointment, though, is the very crude waveform drawing at high magnification: the display engine simply joins the sample dots with straight lines, completely misrepresenting the true waveform shape. 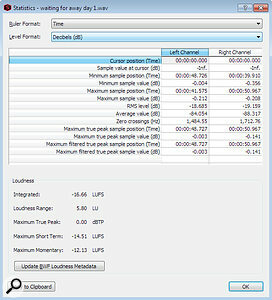 The default peak meter display is also a sample‑peak type and consequently shows incorrect levels when inter‑sample peaks are present. 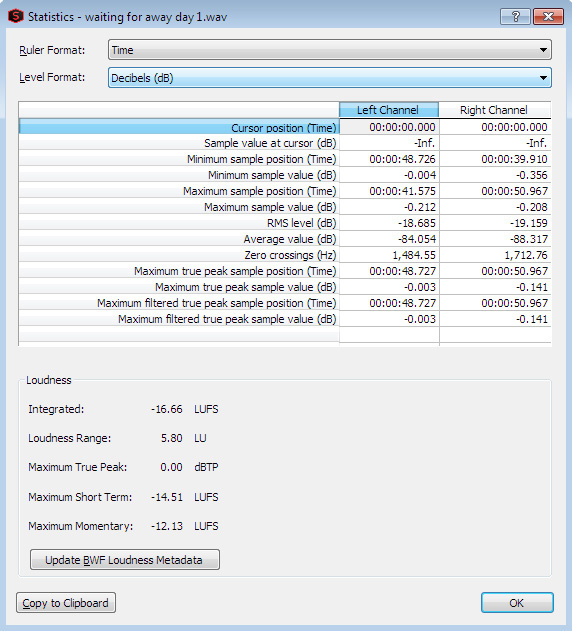 The Statistics window provides comprehensive information about the selected audio.However, I found the Statistics function both useful and accurate; this performs an offline analysis of the audio in the active edit widow to provide values for integrated loudness, loudness range, true‑peak and maximum short‑term and momentary loudness. It also provides the RMS level and the time location of the maximum true‑peak value, amongst a lot of other statistical information. Impressively, Pro 12 can handle just about every known audio file format: there are 36 options in all, including some quite unusual ones like DSF (DSD), AA3/OMA (ATRAC), GIG (GigaSampler instrument), IVC (Intervoice), MP4 (including Apple Lossless), MPEG‑2 transport stream and PCA (Sony Perfect Clarity Audio), to select just a few. For anyone working with audio‑for‑video, Pro 12 includes versatile video file support, too, handling AVI, WMV and both MPEG‑1 and MPEG‑2 (in PAL or NTSC) file formats. 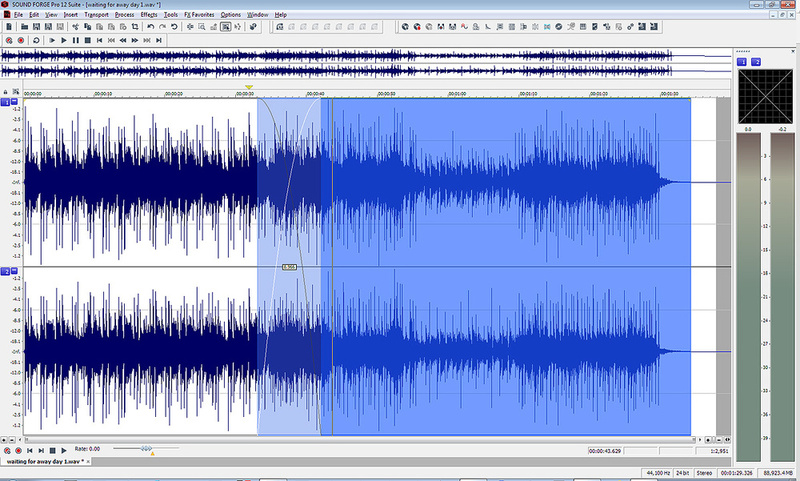 Additional audio files can be opened in additional editing windows, and audio can be cut and pasted between them to build a composite edited track; this is something I often need to do when editing between takes from classical recording sessions, for example. This can be done with mixed stereo or 5.1 files, but it can also be performed just as easily with raw multitrack source recordings of up to 32 tracks, prior to the mixdown. This is a classic music editing technique which I’ve used from the earliest days of Sonic Solutions and into the SADiE platform which I use today, so it is a very comfortable way of working for me. Pro 12 also makes it very quick to select the different editing, viewing and marking tools using keyboard shortcuts. Pressing the D key cycles around the Edit, Magnify, Pencil (if you’re zoomed in far enough) and Event tools. Introducing fades is rather clunky, unfortunately. Linear fades in or out can be applied over a selected duration, which is fine for most ‘topping and tailing’ jobs, but if a more elaborate fade curve is required, the ‘graphic fade’ option has to be selected and nodes added to shape the curve as desired. This is rather slow and cumbersome compared to what I’m used to with SADiE’s continuously variable fade profiles, for example. When a section of audio is inserted into an existing track, it creates an ‘event’, and the junctions of that event can be fine‑tuned as a crossfade by dragging the edges of the outgoing or incoming track around as required. Again, the shapes of the crossfades are not easily tweakable, but the incoming and outgoing levels can be reduced to aid matching across the edit, if necessary. When two audio files overlap within a window, a crossfade is automatically created... ...but if you want to adjust a fade, you will need to open this graphical editor. A very useful playback speed slider control under the main workspace window not only allows ‘spooling’ — in the old‑school tape‑machine sense — forwards or backwards at speed through the file, but also enables slowing the playback down and audio scrubbing back and forth over an edit point. If you do this by dragging the slider, normal replay speed resumes as soon as you let go, but you can also set a constant slower (or faster) speed by using the mouse scroll wheel, or you can drag the reference speed marker below the slider to establish a new ‘normal’ playback speed. A tick box in a preferences window also makes it possible to scrub directly in the waveform window with the mouse, by holding down the Ctrl key. It’s a very versatile system, and one I found myself using a lot. One of the key selling points for the Sound Forge Pro 12 Suite is the vast array of bundled plug‑ins, but although these are generally of good quality, I’m not entirely convinced of their relevance within a mastering and editing platform. I can’t think of a time where I’ve ever felt the need to apply a bit of phasing or tremolo to a track I’m mastering — although, to be fair, the AM‑Track tape simulator and Variverb II both proved useful during my time experimenting with Sound Forge. However, thanks to its VST3 integration I was able to employ a range of external plug‑ins I do use regularly, including some from UA and a virtual Compex F760RS plug‑in from Boz Digital’s +10dB bundle which I like a lot. Usefully, commonly used plug‑ins can be logged in a ‘Favourite effects’ drop‑down list to make them easier and quicker to access. It’s also possible to use effects in the input monitoring chain, which could be useful, on occasion. Among the many new processing tools in Pro 12 are some restoration plug‑ins ported from Magix’s Sequoia. DeHisser is shown here. The major bonus with the Pro 12 Suite is the inclusion of SpectraLayers Pro 5 for spectral‑editing duties. This is worthy of a review in its own right, and although I haven’t yet explored all of its capabilities, it seems a very versatile program with some interesting features, notably the ability to manipulate audio components in separate layers, emulating the editing paradigm of typical image‑editing programs. However, there is some feature duplication here given the inclusion of iZotope’s RX Elements, and as that facility is more familiar to me, I found myself using that more often purely for convenience. A couple of included tools I did play with more extensively, though, are the rather intriguing Gapper/Snipper effects and the Zplane Élastique time‑stretching process. These do the same thing, in essence, but the former provides the ability to manually change the edits and duplications necessary for time‑stretching and compression, which creates all kinds of interesting effects! The new DeClipper, DeHisser and DeClicker tools included in Pro 12 are all effective and easy to use, thanks to good visual displays and minimisation of the controls to just a couple of parameter sliders. Of course, the other string in Sound Forge Pro 12’s bow is its ability to serve as an audio recorder — although you do need to specify the number of channels at the start — and it has some handy auto‑record functions such as starting when an audio threshold is exceeded, or when it receives a MIDI timecode trigger or the real‑time clock reaches a set time. These features make it unusual amongst the plethora of recording tools I have at my disposal. I’m not a regular Sound Forge user, mainly because I was introduced to Cool Edit Pro (now Adobe Audition) and then SADiE in my professional broadcasting career long ago, and have stuck with them given the investment in mastering their facilities over the years. I also use iZotope’s RX a lot now, and these three platforms have met all my editing and mastering requirements to date. However, if I was starting afresh Sound Forge would certainly tick a lot of the right boxes, and the learning curve seems quite manageable, aided by a well‑written integrated help facility and some handy online tutorials. In comparison with earlier versions of Sound Forge which I’ve seen on my travels, Pro 12 seems very similar, with few changes to the user interface and system structure. For many that will be appreciated, as having to rediscover where regular features have been relocated after an upgrade can be very frustrating, but others may see it as a missed opportunity, and I have to say that there are aspects of Sound Forge Pro 12 that feel a little elderly and old‑fashioned compared with current versions of RX, Audition and SADiE. Nevertheless, version 12 of Sound Forge remains very capable and easy to use, and I feel the major improvements in this latest upgrade are ‘under the hood’: compatibility with 64‑bit computer operating systems and VST3 plug‑ins. These changes will serve as a firm basis for any future platform developments. The inclusion of so many plug‑in effects and SpectraLayers Pro 5 in the Pro 12 Suite also helps to ease the pain of the upgrade cost, although I remain unconvinced of the usefulness of some of them. For anyone seeking a versatile and competent multi‑channel editing and mastering platform, this latest version of Sound Forge is well worth investigating, and 30‑day free trials are available to explore the different versions of the software before committing to a purchase. If the bundled plug‑ins have limited appeal, the Pro 12 and Pro 365 variants offer good value for money, as does the Pro 12 Suite if SpectraLayers Pro 5 is an essential part of your armoury. The Pro 12 Suite variant of Sound Forge includes five additional sets of effects plug‑ins, which cover a very wide range of general music‑production duties. Essential FX Suite provides 11 high‑quality standard music production plug‑ins: Limiter, Compressor, Gate, deEsser, Vocal Strip, Tube Stage, Phaser, Chorus‑Flanger, Tremolo Pan, Stereo Delay and Reverb. Analogue Modelling Suite provides four mastering plug‑ins: AM‑Munition (compressor/limiter), AM‑Pulse (transient shaper), AM‑Track (tape simulator/compressor) and AM‑Phibia (tube channel strip). Vintage Effects Suite provides three vintage effects which are intended to sound ‘very analogue’: Corvex (chorus‑flanger), Ecox (tape echo) and Filtox (modulated filter). Variverb II is a modelling reverb based on calculated reflection patterns. Vandal provides virtual guitar and bass amplification and speaker modelling. The 64-bit platform update endows Sound Forge with a viable future. Focused multi-channel editing, mastering and audio restoration tools. Many interesting bundled effects plug-ins. 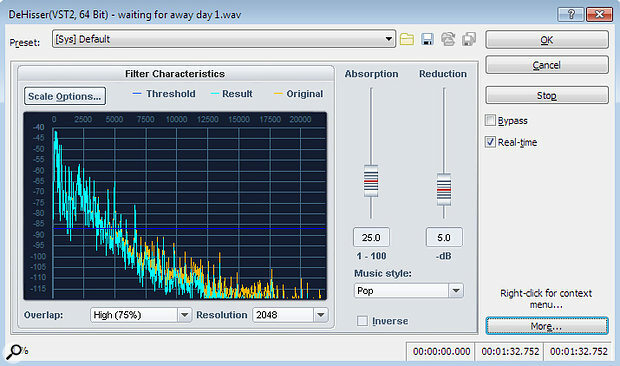 SpectraLayers Pro 5 included in the flagship Pro 12 Suite variant. Outright purchase and monthly subscription options. The look and feel are starting to seem a little dated. Existing users of Sound Forge will be relieved that the interface and workflow remains largely unchanged in this latest update, which essentially modernises the underpinnings for 64-bit computing environments — something which is key to enabling its future development. It also bundles a lot of plug-in effects to sweeten the deal. Sound Forge Audio Studio 12 £49.99; Sound Forge Pro 12 £299; Sound Forge Pro 12 Suite £449; Sound Forge Pro 365 £11.99 per month. Prices include VAT. Sound Forge Audio Studio 12 $59.99; Sound Forge Pro 12 $399; Sound Forge Pro 12 Suite $599; Sound Forge Pro 365 $14.99 per month. Magix Sound Forge Pro 12 Suite. PC with Intel Core i7-4770S CPU (dual 3.1GHz) and 8GB RAM, running 64-bit Windows 7 Home Premium SP1.